Home / Editor's Choice, Entertainment News, Featured Articles, Gossip and Drama, Videos / Disheartening VIDEO of the hyped wildebeest migration, Blame yourselves for destroying the environment. Disheartening VIDEO of the hyped wildebeest migration, Blame yourselves for destroying the environment. Tuesday, August 14, 2018 - The hyped wildebeest migration that was launched by Najib Balala on Monday is a flop. The rivers have dried up and there’s nothing to smile about. 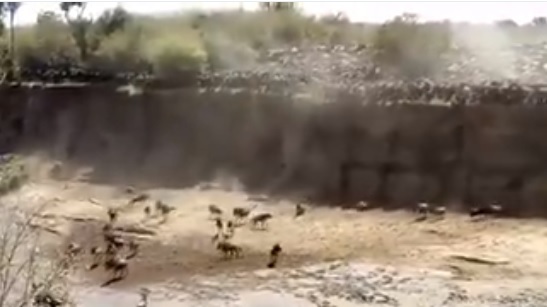 In this video, you can see the wildebeests crushing their bones on the river bed because there’s no water. Gone are the days when they used to swim in overflowing rivers during their migration as some fight off crocodiles. Check out this disheartening video.